Silent Valley Resort is an eco-friendly holiday home located in the heart of the majestic Western Ghats of the Chikmagalur district. 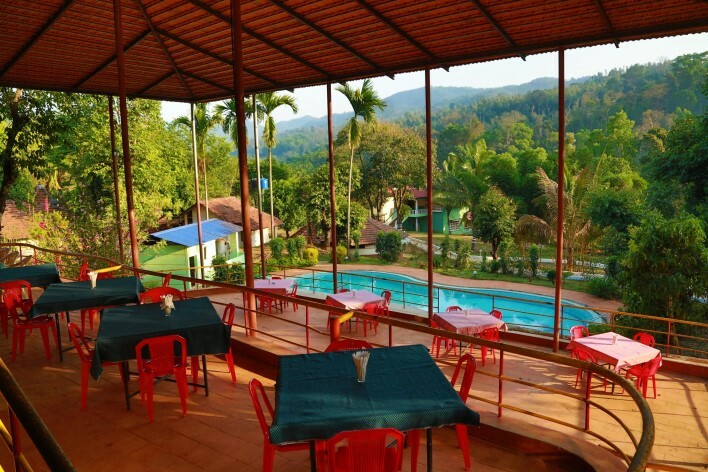 The resort lies between Kalsa and Kudremukh, in a beautiful and lush green valley. Silent Valley’s cottages, constructed with an herbal theme, provide a perfect ambience to bring the visitors closer to nature. Various activities that are arranged in the resort’s premises make it an ideal tourist destination for honeymooners, adventure enthusiasts and nature lovers. The resort’s proximity to several tourist attractions such as Hornadu temple, Subramanya temple, Riverside Picnic Spot and Kallubhavi is another positive factor that works in its favor. The cottages in the resort provide a picturesque view of the surrounding valleys. Every single cottage is named after the herbal plant surrounding it and equipped with modern amenities. Swiss-type tents with attached bathrooms will be available for adventure freaks. Food is served at the three tier multi-cuisine restaurant. At Silent Valley Resort, you’ll have the luxury of swimming in a pool that faces the valley. The in-house sports room has facilities for playing badminton, table tennis, chess, carom, and cards. The resort also has a conference room that can accommodate up to 60 people at any given point of time. Silent Valley is located in the district of Chikmagalur, at a distance of 310 KM from Bangalore. It is easily accessible by road and it takes a six hour drive from Bangalore city to reach the resort. It is also well connected to other cities like Mangaluru (120 KM) and Shivamogga (120 KM) by road. For bookings and other queries, Silent Valley can be contacted via phone or through email. The cottages are reserved on a first come-first served basis. The accommodation is confirmed after the resort office receives a Demand Draft in favor of Silent Valley Corporate Resorts Pvt. Ltd. Rooms will be re-allotted to other people if the DD doesn’t reach their headquarters at Bangalore within three days of tentative booking. The resort also arranges wilderness adventure discovery camps where you can try your hand at river crossing, forest camping, and parasailing. For corporate companies, the resort also arranges theme based gatherings or meetings.